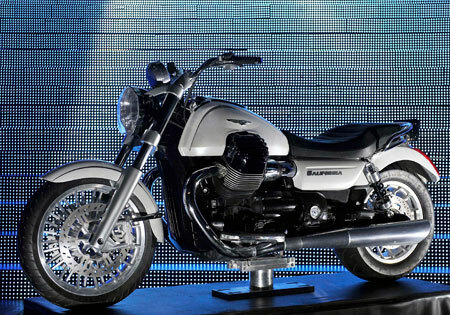 Italian motorcycle manufacturer, Moto Guzzi, unveiled two new models last week in Monte Carlo at the Piaggio Group International Dealer Convention. The newest bikes in the Moto Guzzi lineup include a new “California” model, and a “Scrambler,” that will compete with Triumph’s Bonneville of the same name. A lot of the motorcycle accident lawyers here at Riderz Law are big fans of retro-styled bikes; the new Guzzi Scrambler is no exception. It takes me back to my youth, and the nostalgia of riding around on my first street bike, a 1973 Honda CL350 Street Scrambler. I for one can’t wait till these bikes hit the States. I’m already itching for a test drive. Below is today’s press release from MotoGuzzi’s website. 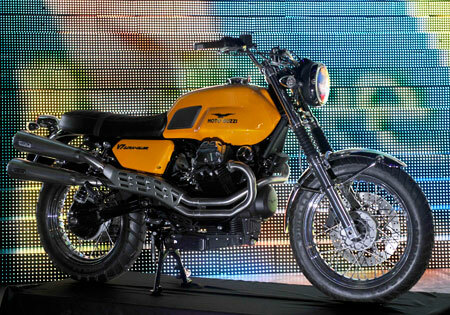 A brand new white Moto Guzzi California and a Scrambler version of the V7 provided an exciting double surprise from Moto Guzzi at the Piaggio Group international dealer meeting in Monte Carlo on 27 and 28 January. The new California prototype, with an original 1400cc transverse V90 twin-cylinder engine, carries on the tradition established by a bike acclaimed in five continents for its comfort, reliability and performance, delivering a re-styling that enhances the architecture of the powertrain and the comfort assured by a generously sized saddle and tank. Fitted neatly around the cylinder unit, the tank heightens the impact of the new valve covers, helping to create a new style element on this irresistible California. All the technical components -wheels, brakes, suspension – are new too, proclaiming the California’s membership of an eagerly awaited new generation of Moto Guzzi bikes. Much more of a classic but equally fascinating, the Moto Guzzi V7 Scrambler is built on on the famous frame of the V7 Classic fitted with a 750cc small-block engine. Chrome trim, spoked wheels and sports tyres create a bike that, in the 1960s, would have qualified as a “Regularity” model like the famous 175 Lodola, which this Scrambler recalls with its low headlamp and integrated instrument panel. The exhaust system with its two raised side-by-side silencers is a distinctive feature of this Moto Guzzi Scrambler.